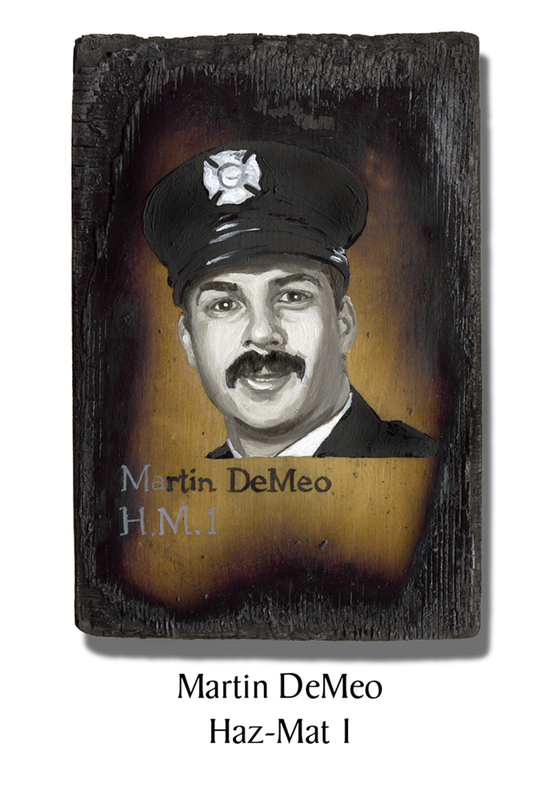 Martin DeMeo, 47, had been with the FDNY for 16 years. He came to firefighting after working several years as a volunteer EMT and paramedic. DeMeo loved the Yankees in particular and baseball in general. Every spring he would mail out a stack of cards to players around the country, and one by one they would get mailed back to him, signed, to add to the collection of cards and baseballs that lined the walls of his son’s bedroom. As a firefighter, DeMeo never liked to miss the “big job.” On 9/11, he didn’t. It’s believed he was on the 12th floor of Tower Two. This entry was posted in Better Angels Stories and tagged 343, 9/11, better angels, Dawn Siebel, FDNY, firefighter, firefighters, firefighters of 9/11, Haz-Mat 1, LODD, Manhattan, Martin DeMeo, memorial, NFFF, paintings, portraits, World Trade Center, WTC. Bookmark the permalink.